I can’t believe all the nice weather we have been getting here in NYC. I for one am excited because it means that I don’t have to wear a heavy coat just yet. This is the kind of Fall weather I like. 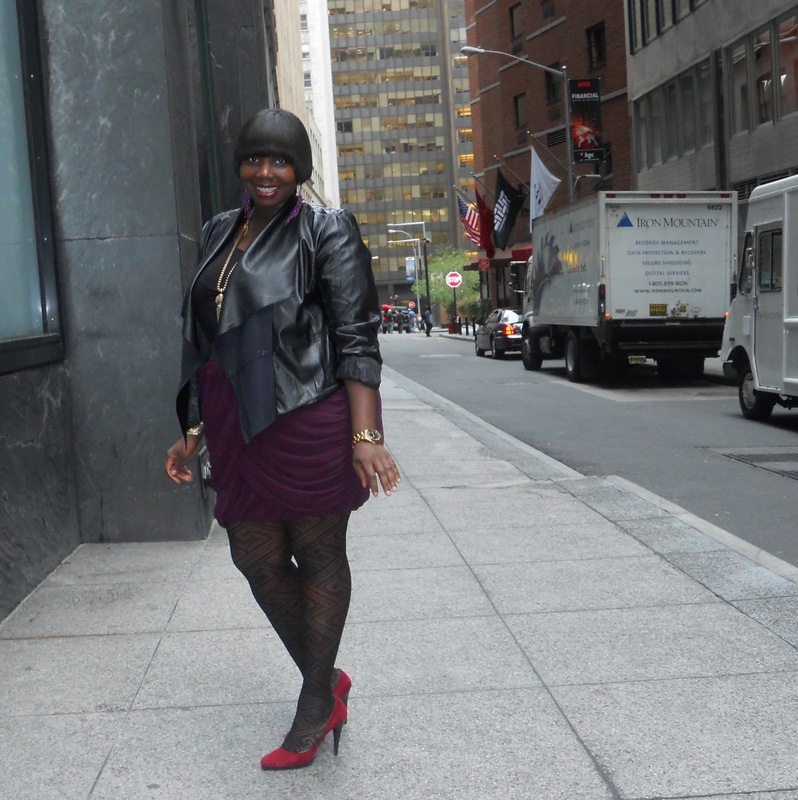 Yesterday was so nice that I decided to breakout my cropped faux leather waterfall jacket from Torrid. I know everyone and their mother has this thing, but, it’s just so darn cute. I wanted to remix this draped maroon colored skirt that I got from Faith 21 and thought that the jacket would go great with it. Last time I wore the skirt with a blush colored tie neck blouse (seen here). I think the jacket makes the look a little more tough girl where as the blouse added a sweet Victorian kind of vibe. 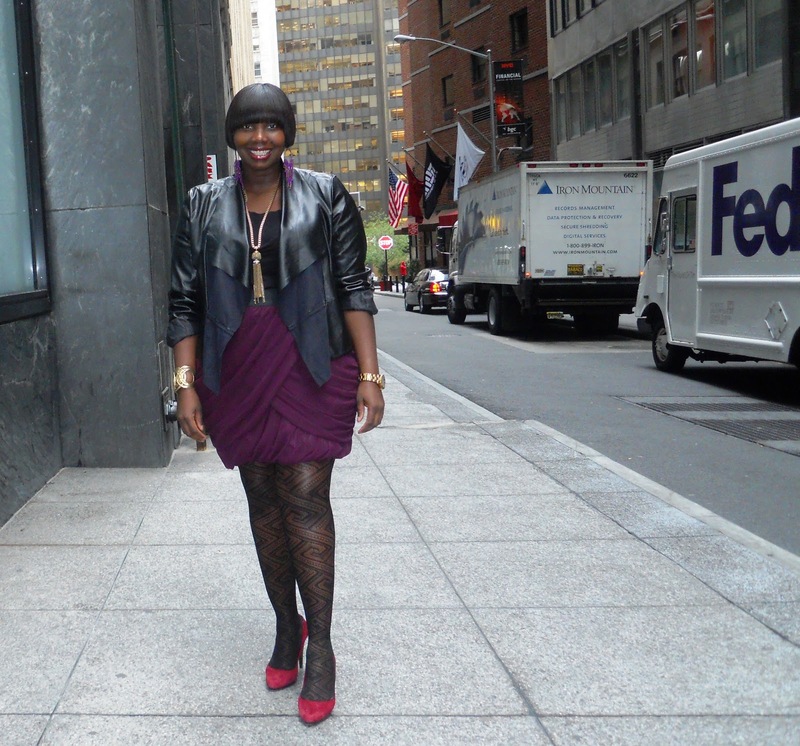 To make the look more interesting, I wanted to pile on accessories and wear a color contrasting shoe. I know some people feel like you should limit accessories, but, I think it’s way cooler sometimes to pile it on. I got this tassel necklace from Loft and I just adore it. I’m also wearing my purple chandelier earrings from H&M. I thought that a red colored shoe would be a nice mix up in the color palette that I’m wearing. Right now I ‘m in to patterned tights and I’m dying to try colored tights this year. I have to admit as much as I like to mix up color, I’m a little weary of bright tights, but, my fellow bloggers are slowly helping me to try them because they look so cute on. For right now I’ll just roll with the black patterned ones.